An idiom – to be the opposite of what is usual or accepted His decision to start his own business certainly flies in the face of good judgment. It’s an intriguing question, as most would count themselves as an average risk taker. On a scale of 1 to 10, probably a 5. Being a comfortable 5, in relation to a risk, means that we are probably operating well within our comfort zone and not pushing any harder. It’s a bit like walking the marathon instead of jogging. When it feels risky or scary, it probably means we are outside the comfort path but if we want to make progress then we probably have to step right outside that very path. As the proverb goes, “there is no gain without pain” but this proverb is not strictly true. Understanding our attitude to risk can help us improve our business development. Instead of avoiding risk, we can start to find ways to manage it. Like the warm up exercises before the marathon, we need to understand what needs warming up before we charge headlong into action. So what actions should we take when confronted with risk? Here are some tips. It may take a few seconds, minutes or hours to complete, depending on your attitude to risk. Make a commitment yes or no! Business owners ARE the business, and without doubt risk decisions reflect the owners comfort zone. 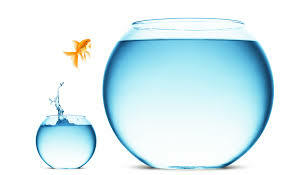 Risk is often associated with fear of failure, but without taking risks there is no evolution, progress or improvement. Don’t avoid risks, take steps to manage them.